DINING PERIOD CLOSED | This listing is for historical reference only. The Frozen Fireworks Spectacular Dessert Party is available as part of the Frozen Summer Fun Premium Package only and not as an individual event. 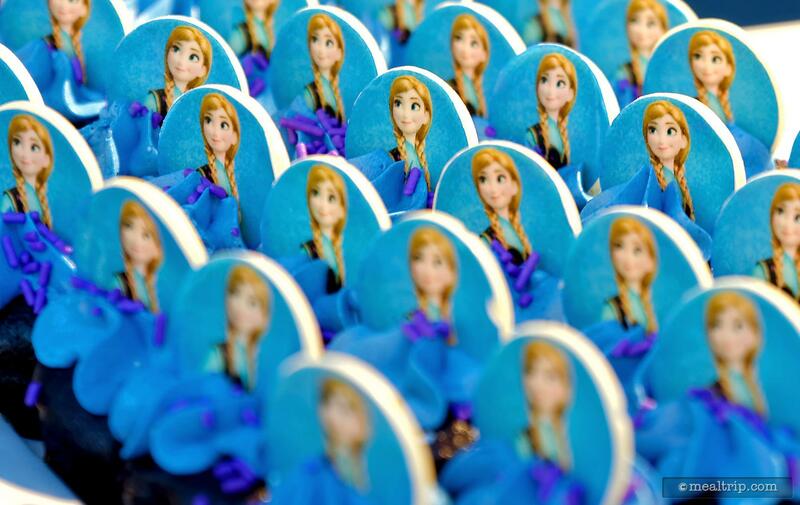 The three-part package includes refreshments and beverages in a reserved viewing area for Anna and Elsa's Royal Welcome Procession beginning at 11:00am. 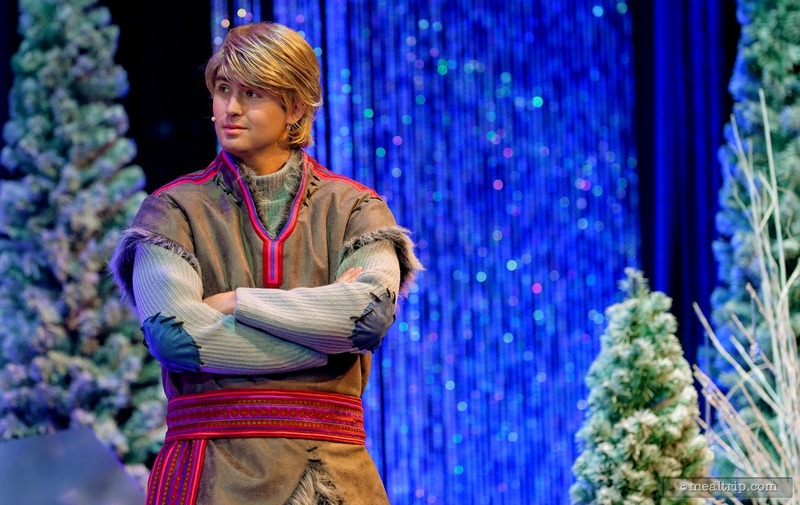 Then, you'll receive early entrance (and therefore a reserved seat) into one of the day's "A Frozen Sing-Along Celebration" shows, that happen between 12:30pm - 7:00pm. (You can make your preferred show time selection at the event check-in desk, in front of Min and Bill's before the Welcome Procession.) 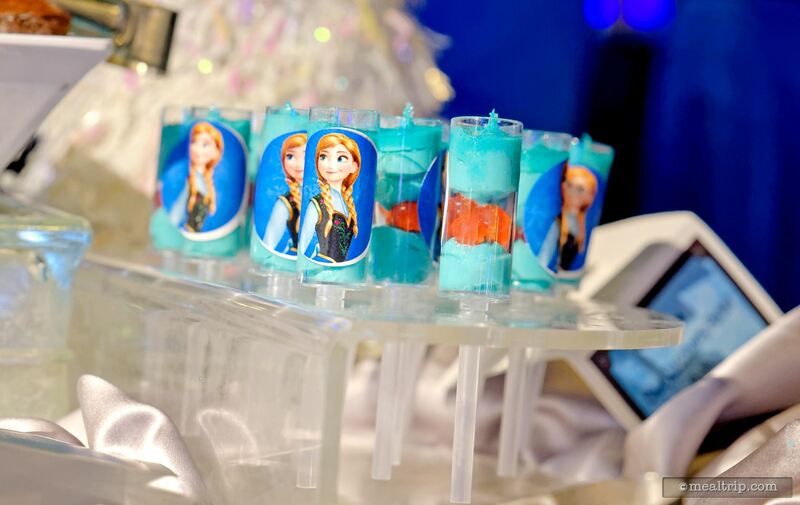 That evening, the event package ends with the Frozen Fireworks Spectacular Viewing Dessert Party (same location as the reception viewing). 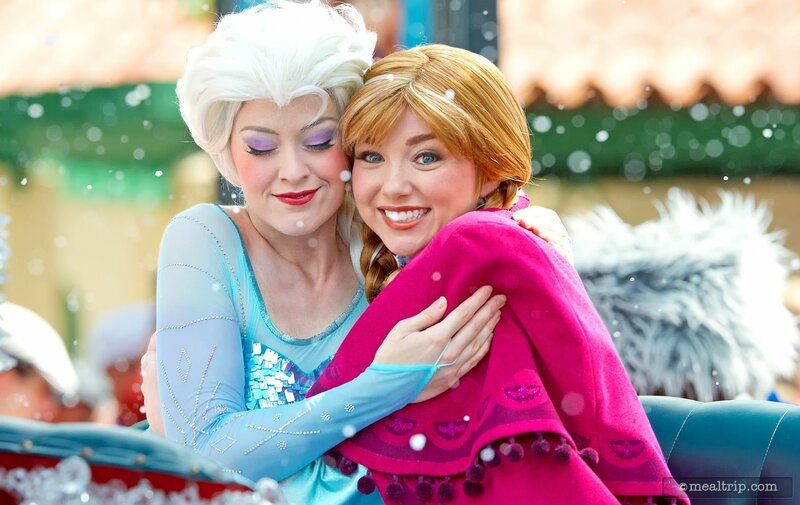 The Frozen Summer Fun Premium Package runs every day from July 5th, 2014 until August 22nd, 2014 and then resumes on August 24th, 2014 until September 1st, 2014. Reservations are highly recommended, and prices for the premium package are $59.00 for adults, and $34.00 for children (tax and gratuity included). To book your reservation, call (407) 939-1939. For more information about the event, please visit the Disney event information page, using the link to the right. The desserts and beverages at the Frozen Fireworks Spectacular Dessert Party (which is part of the Frozen Summer Fun Premium Package) really surprised me… in a good way! While it's true the current party location (just at the end of Hollywood Boulevard and directly in front of Sorcerer Mickey's hat ) may not be a perfect spot for viewing the fireworks, the desserts and beverages more than made up for that fact. After having a rather, nondescript experience with the desserts at the "Feel the Force" dessert party (held in the same location), I was expecting more of the same, but the pastry and dessert chefs really came up with some original, well-themed creations that are not readily available at other dessert parties. For me, that's what will ultimately make these new (and ever growing) dessert party offerings successful… it's their diversity. If I can get the same desserts everywhere, what's the point of going to them all? So I was pleased to find quite a few, really yummy, all too cute and well themed items here. Let's start off with the location though… there's no getting around the fact that there's not really an "optimal viewing location" anywhere at Hollywood Studios for watching fireworks. There… I said it. Everyone thinks there is, because you always leave saying to yourself "there's got to be a better area to watch these, than where we were." But trust me folks… there's not. The quintessential, "looking down Main Street at Cinderella's Castle with the Fireworks going off behind that" location just doesn't exist at the Studios. So for me, any location where there's a bartender handing you a cocktail with citrus vodka in it… tends to be my favorite spot for watching the fireworks. 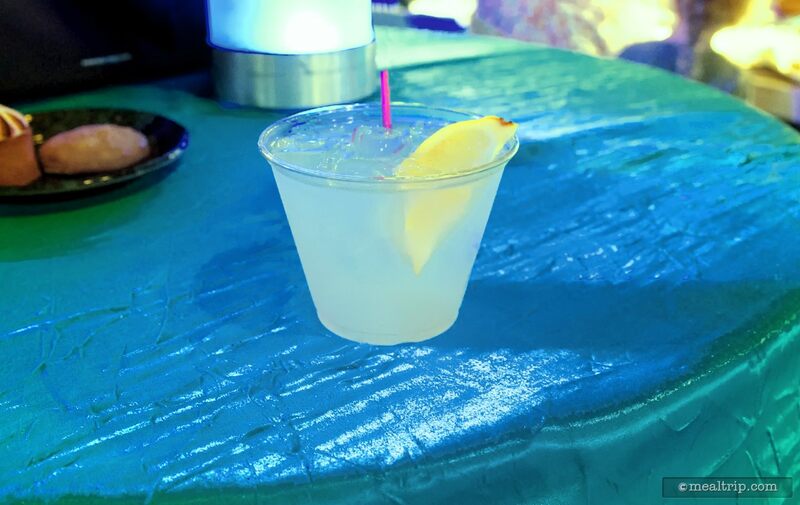 Fortunately, there were two stations at the Frozen dessert party where bartender were doing just that. There are themed non-adult beverage for the little ones here as well. Juice only type of mixes such as "Troll Juice" which is lemonade and blueberry Monin syrup, and "Olaf's Summer Sunset" combining passion fruit, orange and guava juice with peach Monin syrup. I know, I know… parents recognizing the Monin name are thinking "hey, Monin make liqueurs"… well Monin does make a line of nonalcoholic premium syrups, that are cane sugar based… so it's all good… as long as you're on cane sugar's side. Also available are a couple of sodas, water, and various coffee and tea flavors being offered at a giant beverage table off to one side of the main dessert area. For me though, the three "adult" beverages are what I kept going back for. There were two "adult beverage" stations on the night I went, both serving the same drinks, (and only those drinks, they don't really have a "full bar" at their disposal). 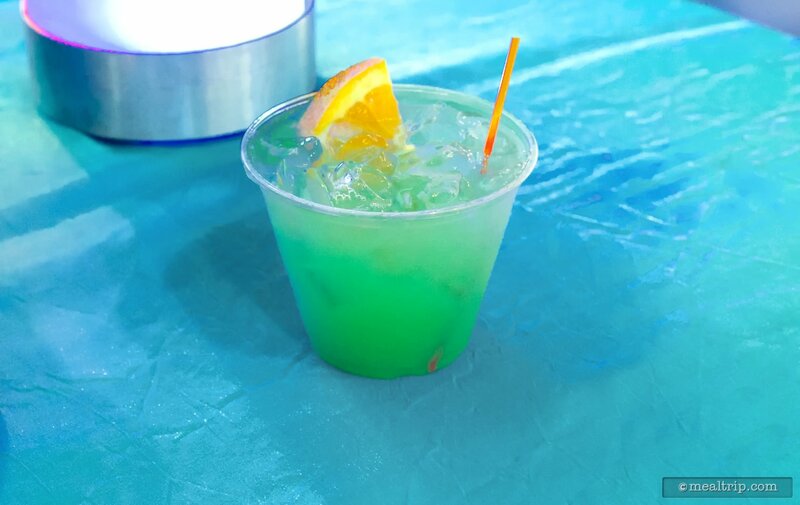 The "Iced Summer" combined Blue Curaçao Liqueur (made from the peels of Laraha Oranges, if you were wondering), rum, pineapple juice and just a bit of soda. A "Warm Winter Grog" (which fortunately, isn't served warm), which is a combination of citrus vodka, lemonade and bit of soda as well (ginger ale, for those trying to replicate the recipe). And also an iced coffee, featuring Baileys and Kahlua. And just for those of you that haven't yet been to one of these shindigs, yeah… you can just try as many of those as you'd like. 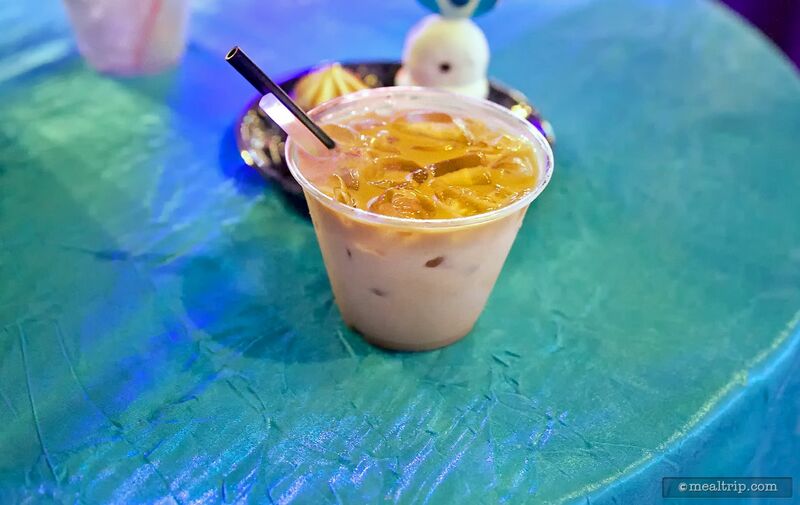 If the bartender is there, you can walk up and get a drink… that's the beauty of an "inclusive" dessert party. Oh, and there are desserts too! There are a couple of "standards" that you'll find at most of these parties, such as Brownie BItes and Kristoff's No Sugar Added Lemon Icebox Cookies. (Just between you and me, Kristoff needs to find some sugar when he's baking, or he can just keep his cookies to himself.) There were Strawberry Shortcake cups, Key Lime Tarts and pair of mini cupcakes, with the Anna cupcake being chocolate based, and the Else cupcake having a vanilla cake base. I do believe the "ice cream box on wheels" made it back as well, so Mickey Premium Ice Cream Bars, Mickey Ice Cream Sandwiches and various frozen fruit bars were available as well. 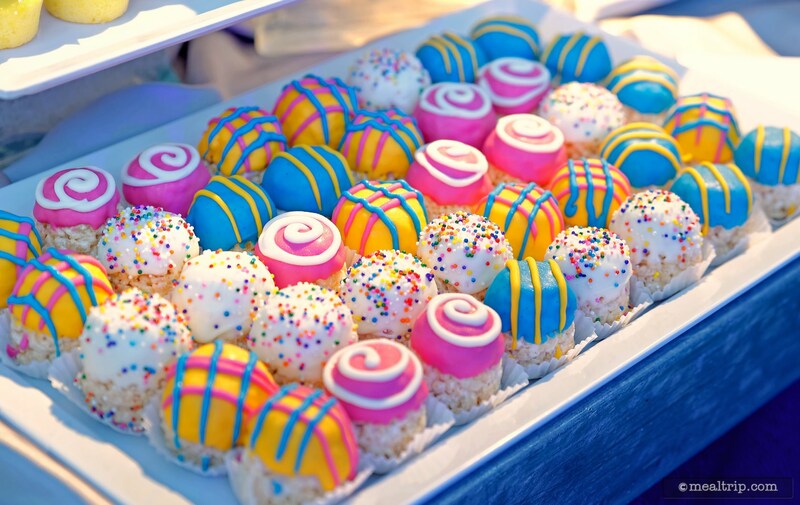 I know white chocolate topped crispy bon bons are not new or terribly hard to find at dessert parties, but I really like them, and was glad to see them at this party because they're just so beautiful. Someone really, actually has to decorate all those tiny globes of gooey, crispy goodness by hand. So hats off to you Crispy Bon Bon decorator, I appreciate your hard work! The chocolate fondue station (inspired by the lyrics from Frozen's "Love Is An Open Door") is a bit different, and something I haven't seen very much of at the various Disney dessert parties. 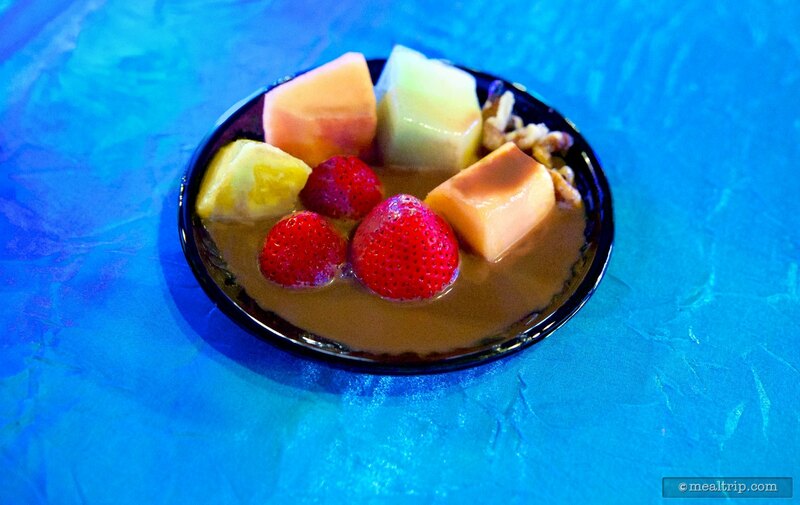 There is an ample supply of sliced and diced fresh fruit including pineapple, strawberries, orange and green mellon, apple slices, marshmallows, pretzels, walnuts and decorative sprinkles, set out on a table. 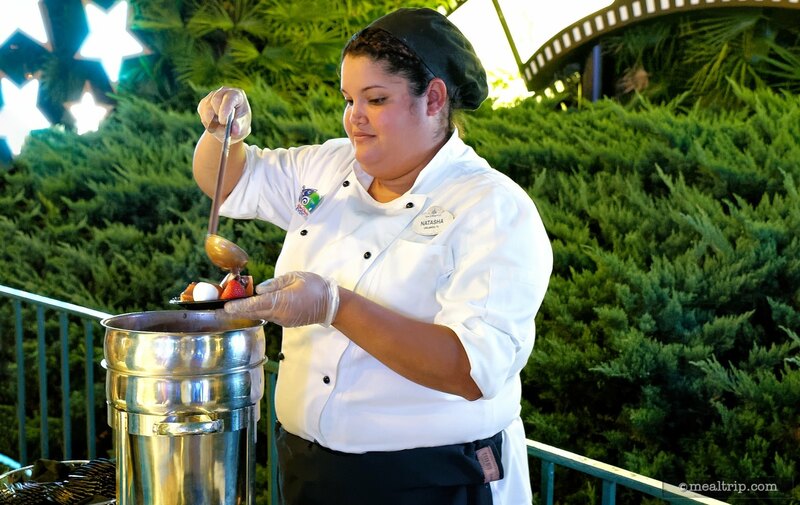 Once you've plated your selections, a cast member at the end of the station will cover the plate with warm milk chocolate fondue. The fondue itself seems to a cross between a watery carmel and milk chocolate, but the activity is the fun part of this station. Getting to pick out what you want on your plate was as fun for me, as it is for children I'm sure. Personally, I would prefer a dark chocolate fondue at the end of the line, but that would (budgets begin what they are) add to the expense of the station I'm sure. Another new addition here is the Blue Raspberry Parfait Pushup. We've seen the pushup device before, but in this variation of the fun dessert, a couple of large raspberry boba (more commonly found in bubble tea) were placed in between two layers of a creamy, cheesecake-like substance. It's one of those things where the description just doesn't match how interesting the dessert is. It's fun to be sure, and if you've never experienced popping bobas before, this is a great introduction to the boba craze. 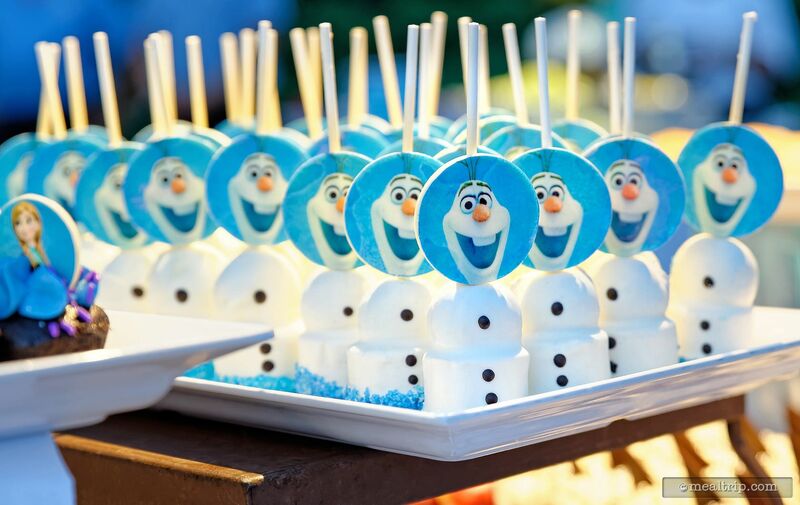 Finally, that brings us to my favorite dessert, and one that I'm sure I can't get at any other dessert party… the Olaf Cake on a Stick Snowman. Olaf's bottom-half is a white cake that's actually filled with a creamy cheesecake-like substance, similar to what's being used in the Parfait Pushups, while his top-half (the round snowball part) is a spice cake. It's a really delicious mix, that's all covered with a white chocolate, hand decorated with details, and footed with a coarse blue sugar base. 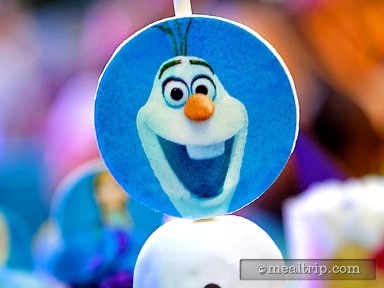 A lot of time goes into each one of these Olaf's to be sure, but it's all worth it. This is one unique treat you won't find at other dessert parties. 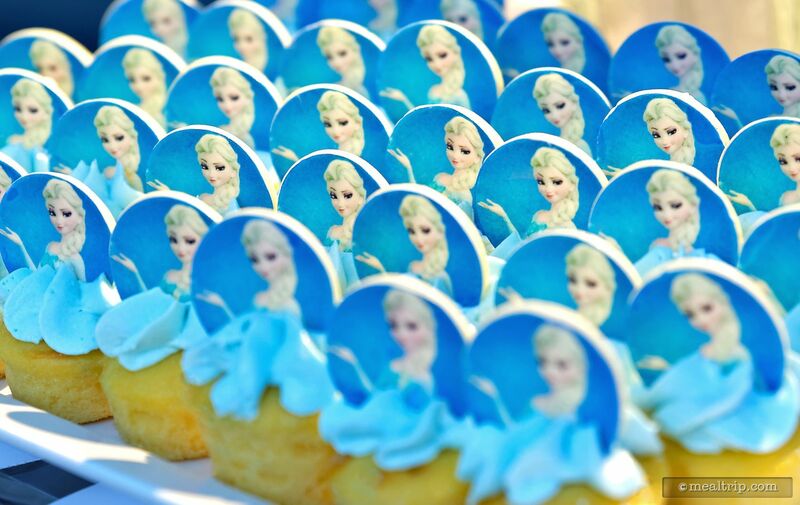 All in all, this dessert party was a hit with me! Yes, yes, there's plenty more to the "premium package" including Premium Mickey Ice Cream bars, frozen fruit cups, and soda in the morning processional-parade segment, and a reserved seating area during the sing-along. That's all icing on the cake as far as I'm concerned, making the Frozen Summer Fun Premium Package an even better value. 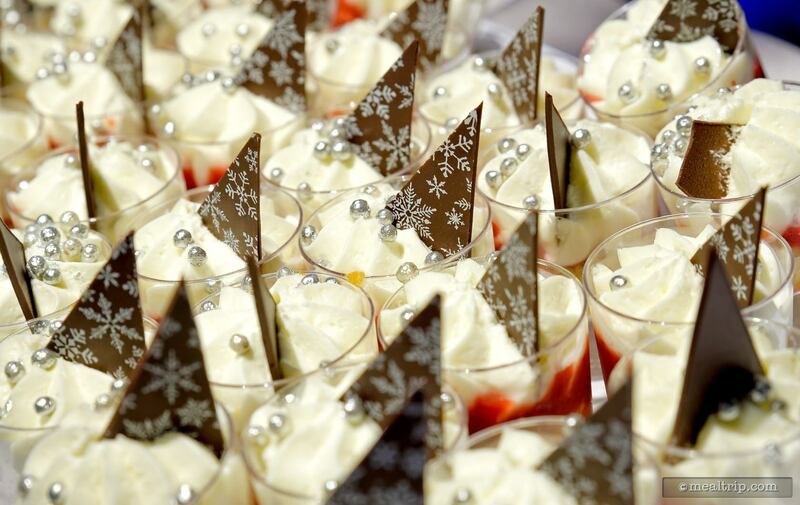 Every dessert party should have it's own personality, desserts and beverages, so it's difficult to draw any kind of comparison between events. But… I did feel the desserts at Star Wars Weekend's "Feel The Force" dessert party were a bit more "run of the mill". Sure the desserts were decorated, but there were not those one or two items that really stick out in your mind as being unique and different than what you could get elsewhere. 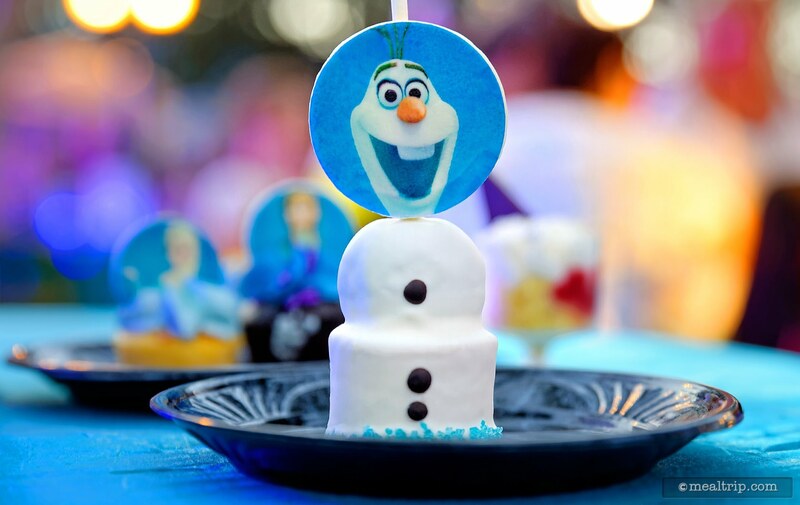 The Frozen dessert party's chocolate fondue station, Blue Raspberry Parfait Pushup, and Olaf Cake on a Stick Snowman are all unique to this dessert party and this experience. Even though many of this year's parties are booked solid, I'd be willing to bet they'll all return next year as well, and if they do… I'd give this a solid "give it a try". I'm really glad I did! CLICK HERE to view all 19 images in our photo gallery.